I had the opportunity to do a project in San Fernando, Pampanga and went around the poblacion taking photos showing transport and traffic conditions in the old city center. To many travelers, perhaps the San Fernando they know is associated with what they see along the Gapan-San Fernando-Olongapo Road (also known as Jose Abad Santos Ave along this stretch in the city) after exiting the NLEX. There is much commercial development along the stretch of the highway between NLEX and McArthur Highway and of course, around the exit itself as mall giants SM and Robinsons have branches there. The “real” San Fernando is located only a few kilometers south from GSO via McArthur and the poblacion reveals a lot about the heritage or old character of the city and perhaps its potential for restoration as an example of urban development during the Spanish times. Following are a collection of photographs from field work that we did in the city. 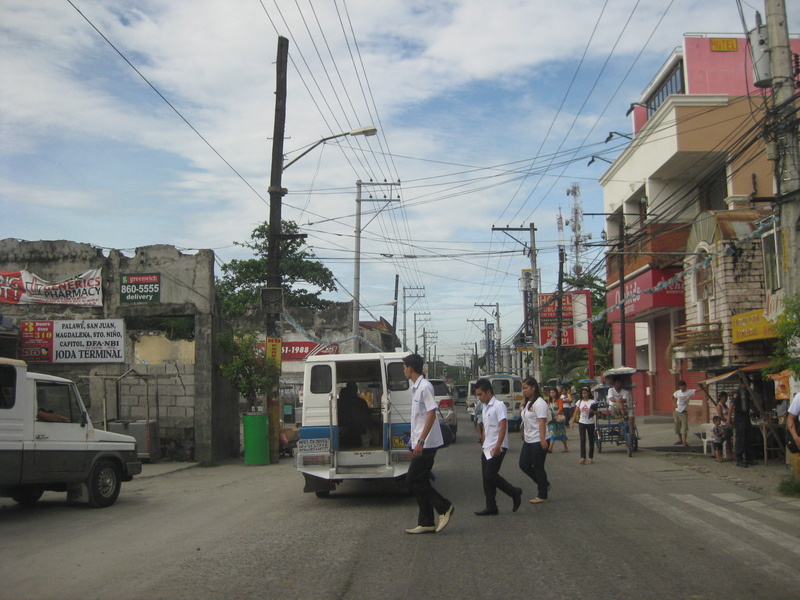 We took a walk around the principal roads including McArthur, Tiomico, Consunji, Gen. Hizon., Abad Santos and Limjoco. Tiomico eventually becomes the Capitol Blvd. as it leads to the provincial capitol complex while Consunji becomes Sto. Nino Viejo when traversed westbound. 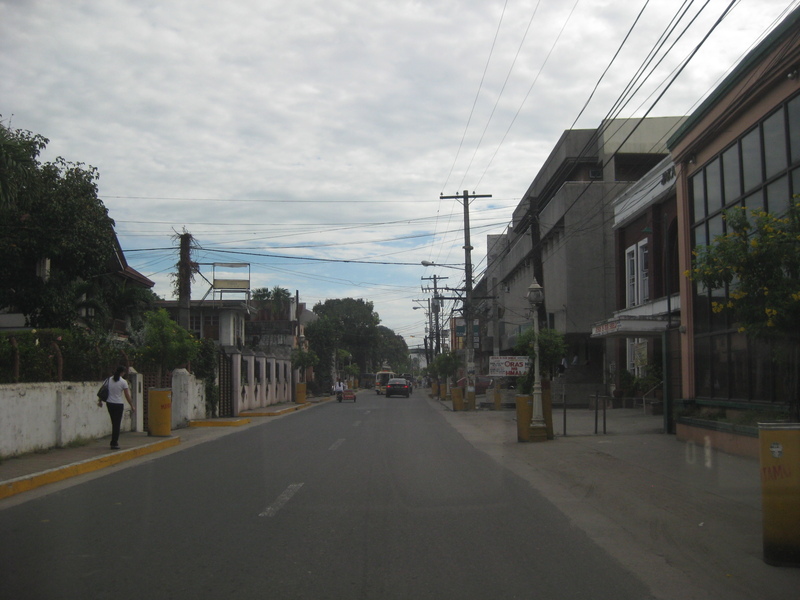 The latter becomes Lazatin Blvd, which crosses GSO towards the north. Gen. Hizon appears to be the original alignment of the Manila North Road (McArthur), which passed through the heart of the city. 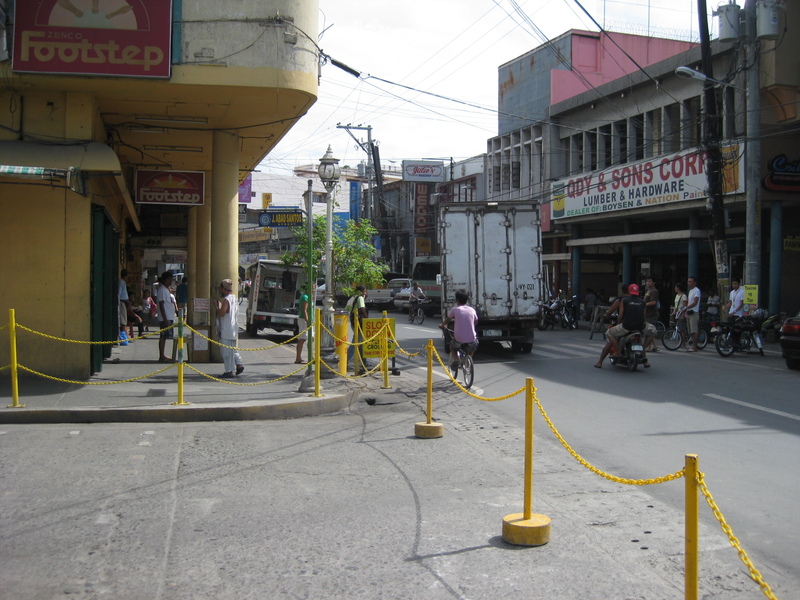 Sometime in the not so distant past, a bypass road was constructed as traffic became constricted in the poblacion and many travelers not bound for San Fernando were inconvenienced by the congestion. This is clear from the maps of the area. Poblacion preview – The San Fernando cathedral as seen from the approach of the bridge along Gen. Hizon Ave. The bridge itself appears to be an old one. It is a two-lane structure and its lamp posts reminded me of a similar bridge in Melaka, Malaysia I saw only this year. 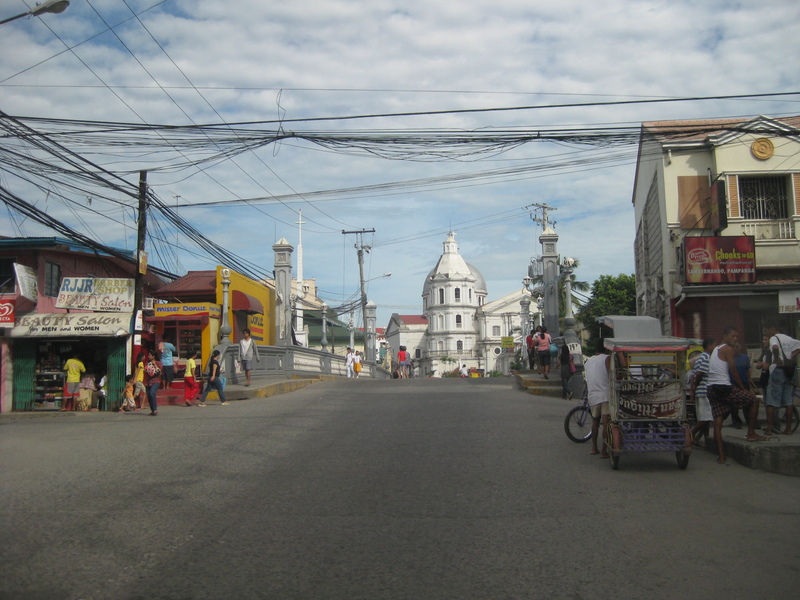 The cathedral as seen from the bridge – the junction immediately after the bridge is Gen. Hizon’s intersection with Consunji Ave. The latter is one way eastbound so left turns are prohibited at the junction. 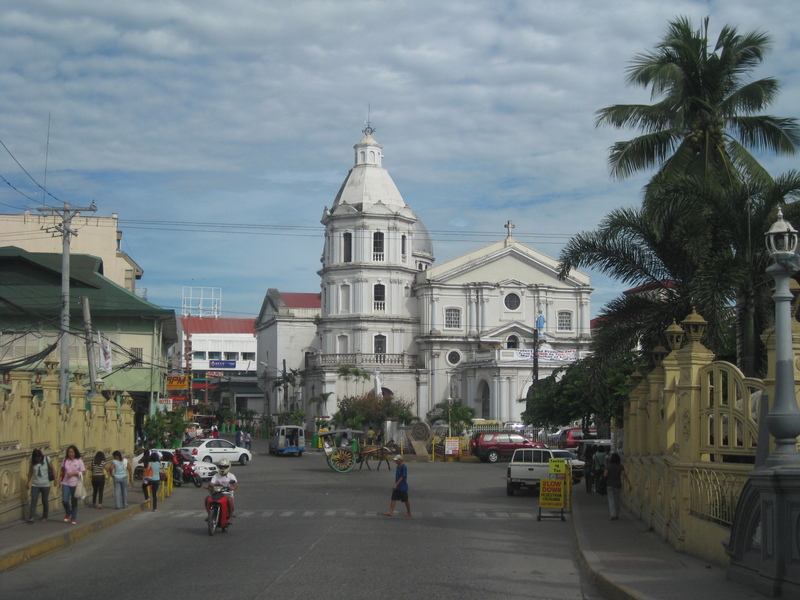 Vehicles may go through towards Tiomico (the next junction right after the cathedral) or right where travelers will immediately see city hall on the right side of the road and just across from the cathedral; the typical set-up of most old towns in the Philippines. 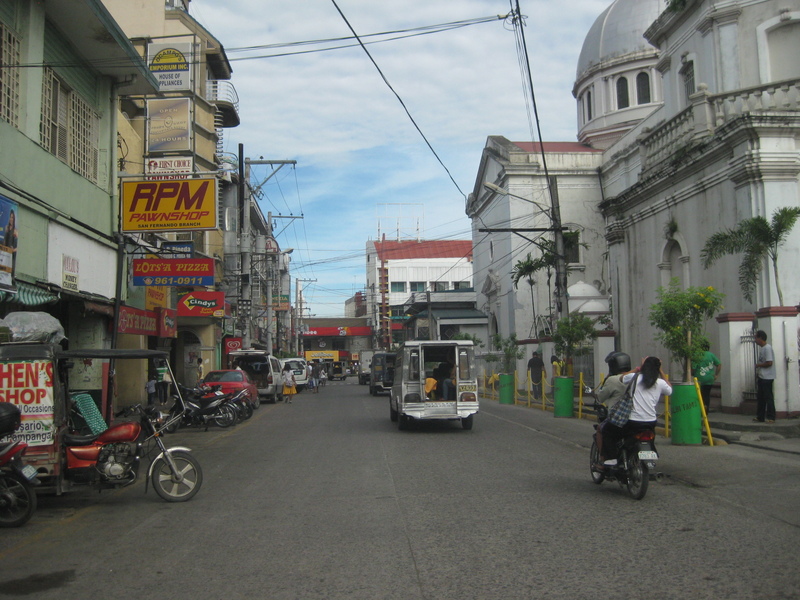 Gen. Hizon Ave. towards Tiomico – the commercial establishments around the cathedral are very similar to those you would in many other old cities and towns around the country. Pedestrians are supposed to take the arcade sidewalks just in front of the ground floors of the buildings on the left and underneath their second floors. These seem to be blocked by merchandise or stalls so some pedestrians take the street instead. 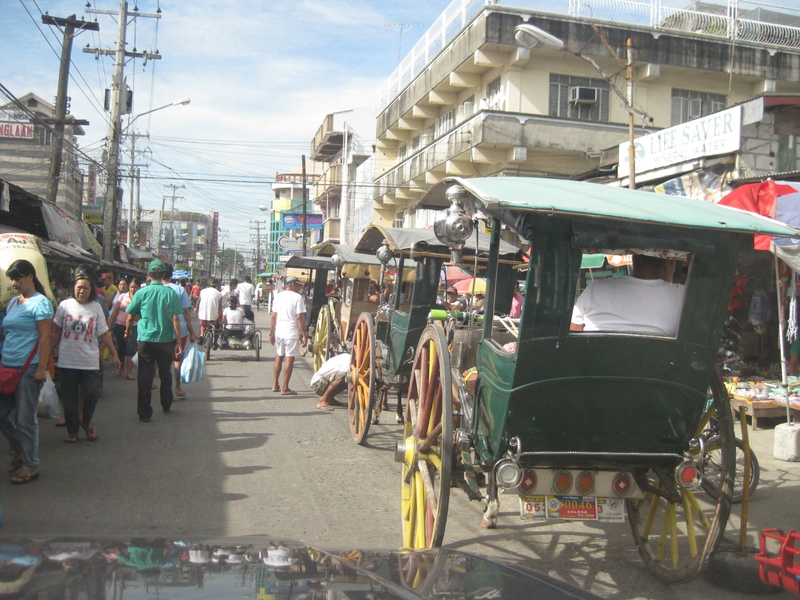 The photo also shows typical on-street parking in the poblacion. 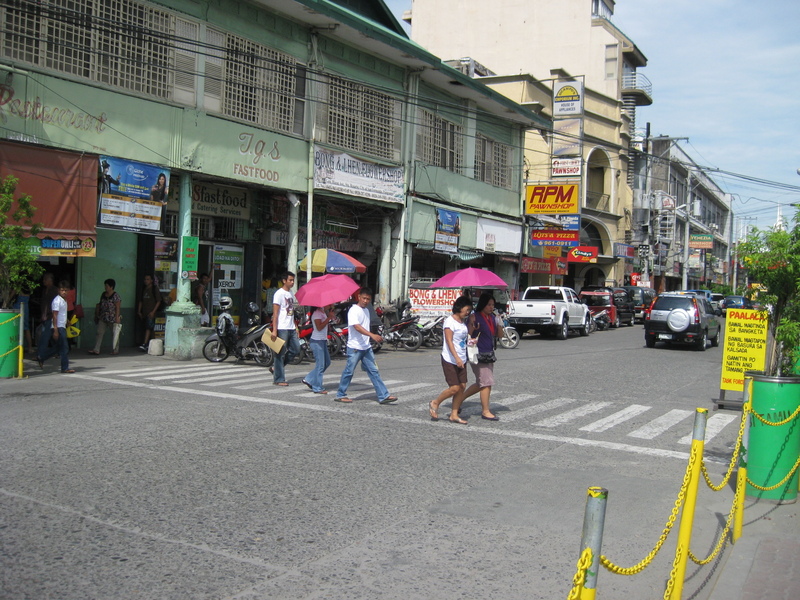 Pedestrian flow – the photo shows pedestrians crossing Gen. Hizon from the commercial establishments on the left towards the cathedral. The photo also shows people using the walkways integrated with the buildings (arcade), providing shelters against the elements, in this case the scorching sun. Rotonda? – at what seems to be the end of Gen. Hizon is a curious set-up which functions as a rotonda. Tiomico is also a one way street (westbound) and there is another intersection just ahead in the photo after turning right from Gen. Hizon. 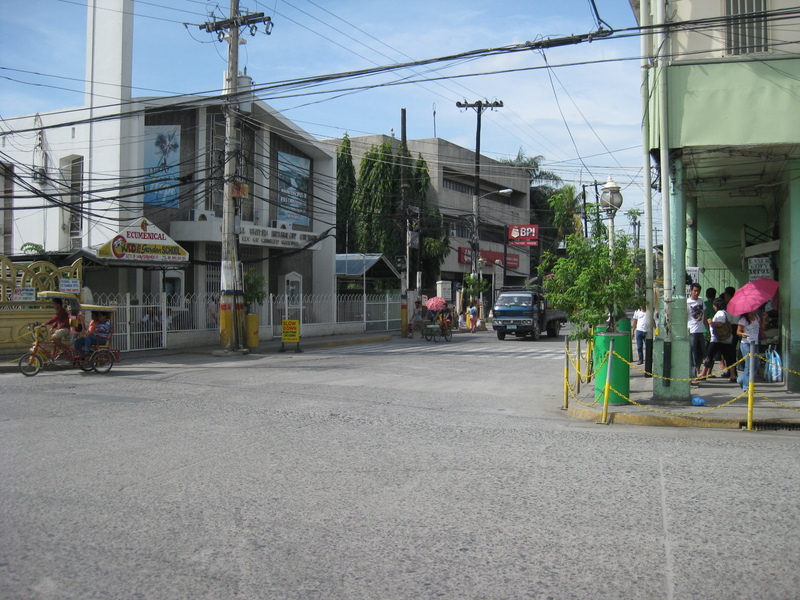 Off-set intersection – Gen. Hizon actually continues as B. Mendoza Ave. (which eventually leads to a junction with McArthur to the north) from the junction that is identified by the 7-Eleven on one of its corners that is visible in the photo. The public market is just across from the building housing the convenience store. City hall – the building is just across from the cathedral and the parking problems in the city are clear from this photo alone. 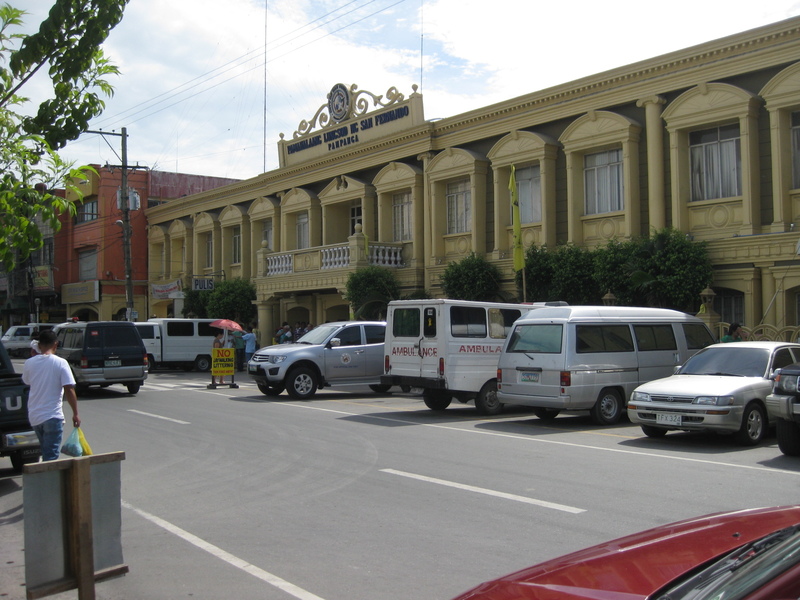 City halls generate a lot of traffic due to the transactions, meetings and other activities associated with the institution. On weekdays, most parking in front of the building and across at the cathedral are probably by people with business at city hall. During Sundays, parking would be for church-goers. Walkways – the arcade/pedestrian walkways I were referring to earlier are much like the one shown in the left of the photo in front of a shoe store. The set-up allows for pedestrians to be shielded from the elements as they should be able to walk comfortably without getting wet during the rainy season or exposed directly to the sun during the summer. The street on the right is Consunji and leads to the public market, part of which is just behind the yellow building. 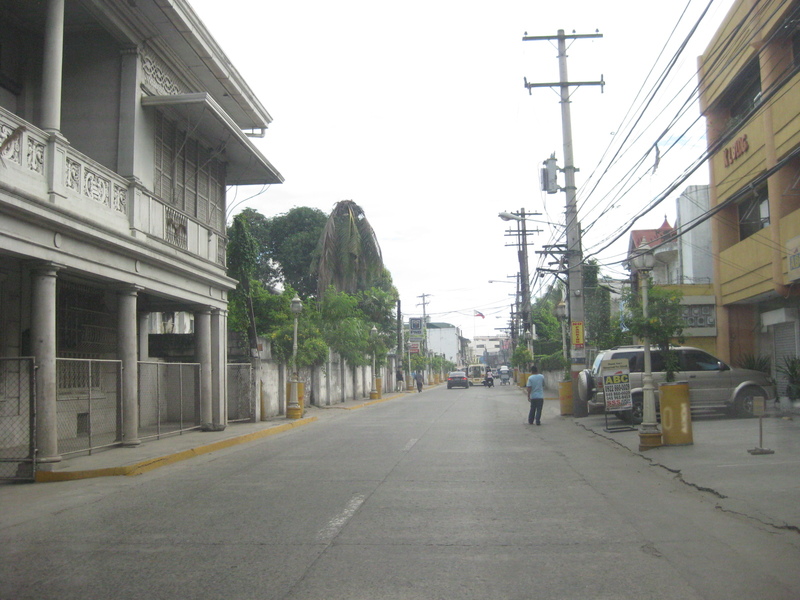 Jose Abad Santos Street – the stretch was closed to motor vehicles at the time we walked around the poblacion. There was a sports event at the time and the street was being used for races – note the writing along the zebra crossing indicating the starting line for the race. 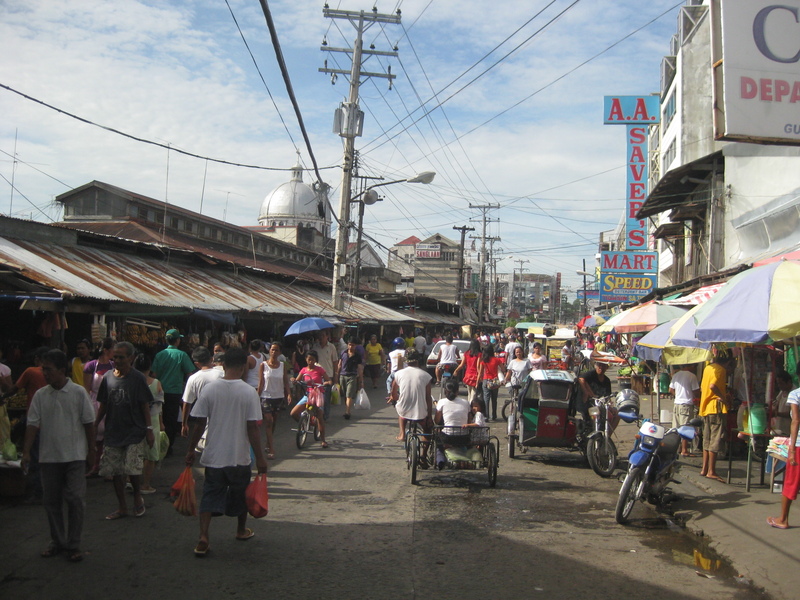 Consunji by the market – the one-way street is lined with commercial establishments and part of the street is used as parking, a common problem in other poblacions in similar cities. Prohibition? 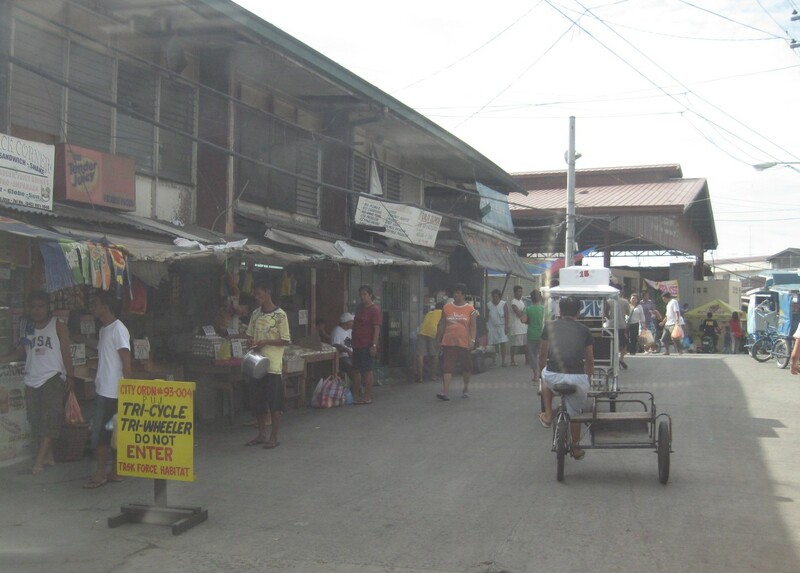 – this is Tiomico Street in the public market area. 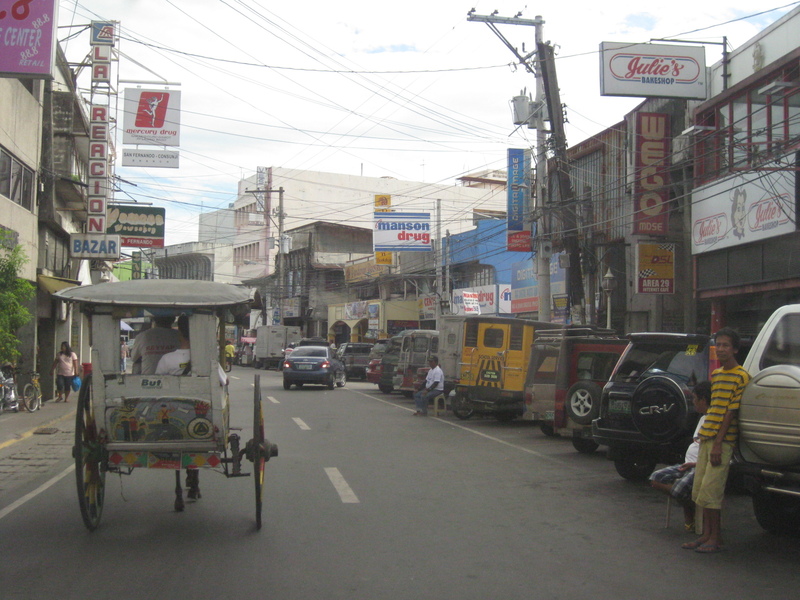 The sign on the lower left says 3-wheelers are not allowed along this stretch of the street and yet we found most of the vehicles to be exactly what is supposed to be prohibited – tricycles and pedicabs. The stretch could have been nice if it were developed into a pedestrian street instead with limited access to motor vehicles (perhaps for deliveries only?) much like those market streets in Japan. 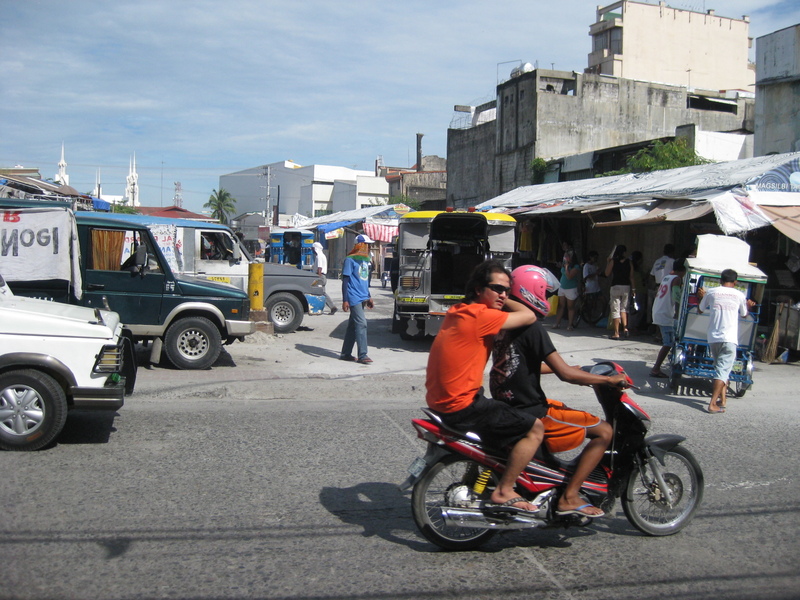 Typical mayhem – further down the street is a mix of people, bicycles, pedicabs, tricycles, and other motor vehicles. There’s potential here for re-development or transformation that would enable the revival of this commercial district that includes the public market. 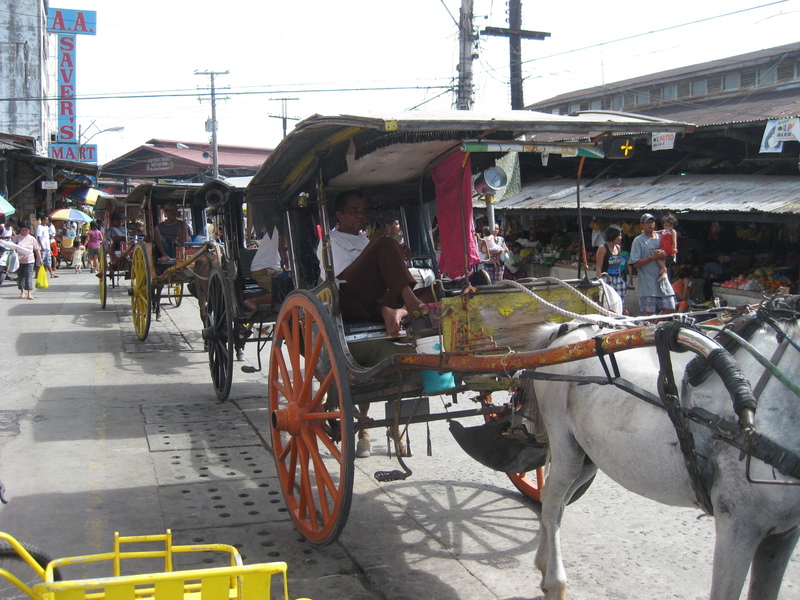 Blast from the past – aside from the typical tricycles and pedicabs providing for local public transport, we were a bit surprised that there were still calesas, or two-wheelers pulled by horses. At the time (2010), the kutseros or drivers charged PhP 10 to 20 (about 20 to 50 US cents) per passenger depending on the destination. 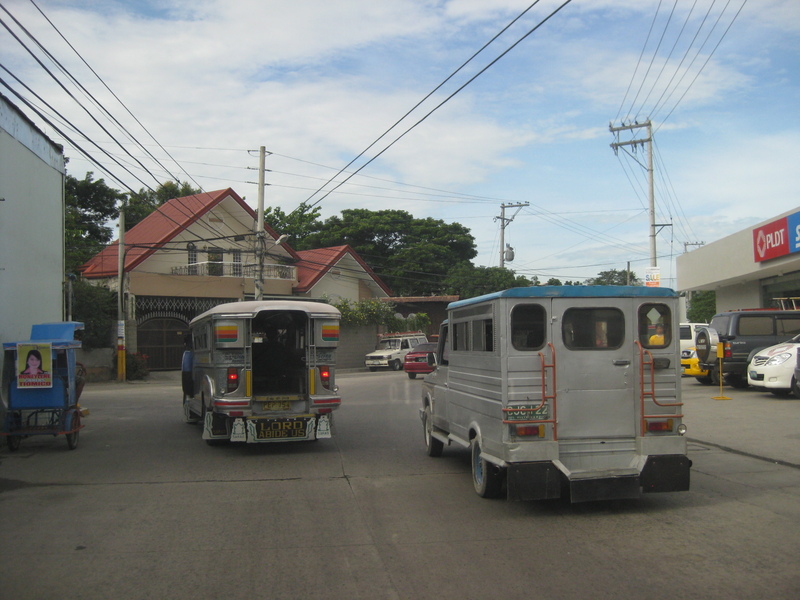 These calesas are all registered with the local government, and they have license plates indicating their registration. Queue – most of the horses pulling the calesas looked healthy enough and well-cared for. The kutseros were kind enough to answer our inquiries about their operations. I think the city should carefully consider how to take advantage of its heritage/character to promote sustainable transport including walking, NMT and the calesas for moving around the poblacion and its immediate environs. Two-seaters – the passenger capacity for the calesas is two. To address the poop issue, there is a contraption just behind the horse and hanging under the carriage that catches dung and prevents it from being spilled unto the roads. I assume these are disposed of properly. 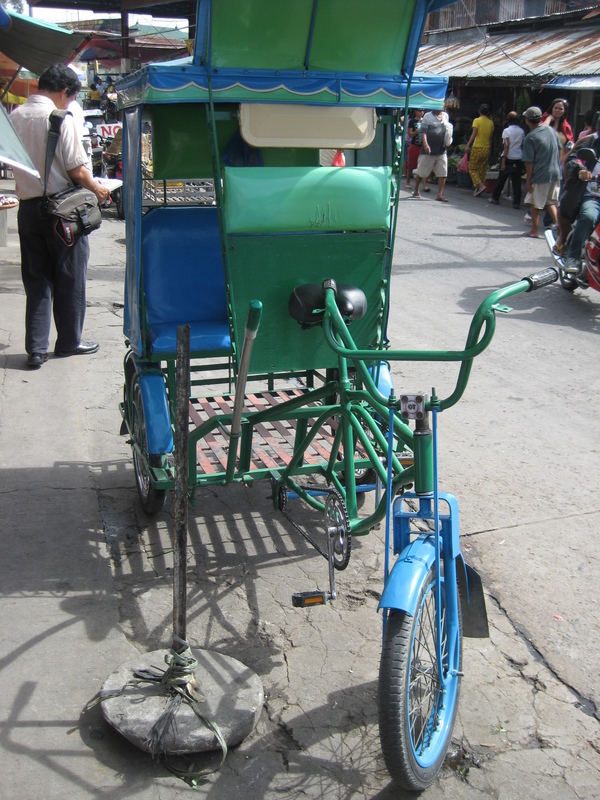 Alternative design – the pedicabs in San Fernando are different from the conventional ones we see in other cities or towns. Noticeable from the photo is that this is not your regular bicycle with a sidecar set-up. These are fabricated 3-wheelers that seem to be sleeker if not more stable than the usual pedicabs we’ve seen. 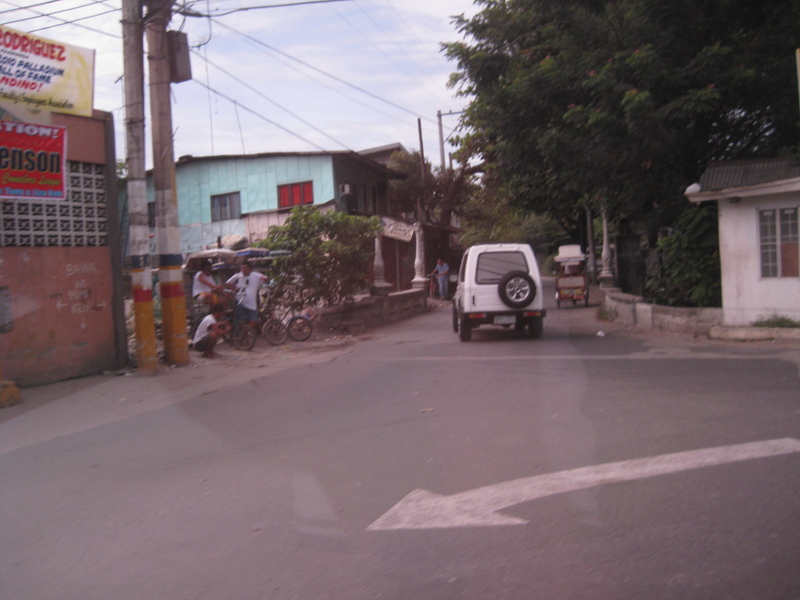 Tiomico Street – just after Gen. Hizon, one gets an idea of the challenges for transport and traffic in San Fernando. 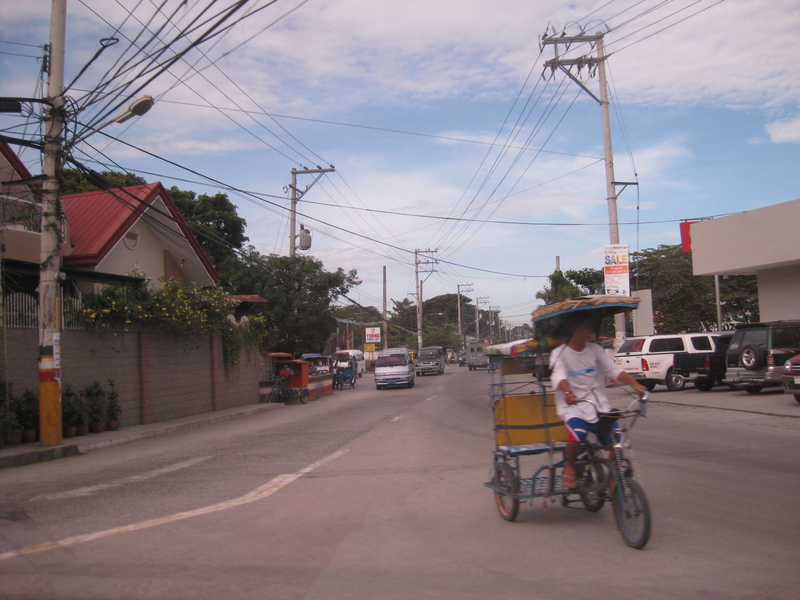 The one-way street has no pavement markings, obstructed signs (if any at all), no pedestrian sidewalks and vehicles each doing their own thing along the road (e.g., motorcycle zigzagging through traffic, jeepneys stopping anywhere, etc.). 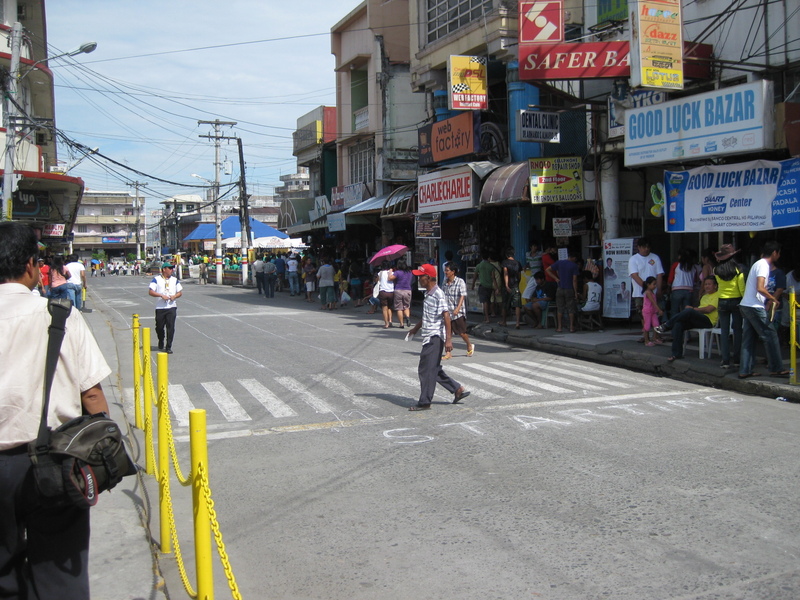 Walkability – people generally walk along the carriageway, as shown in the photo, due to a lack of proper facilities like sidewalks. Though there are remnants of zebra crossings, people also generally cross anywhere and so contribute to the mayhem along the streets. There was a proposal for a pedestrian overpass but such is so inappropriate given the narrow streets. No one will use such an overpass as it would be more an inconvenience to pedestrians. A more appropriate treatment would probably be traffic calming or other approaches that would prioritize pedestrians over motor vehicles in the poblacion area. 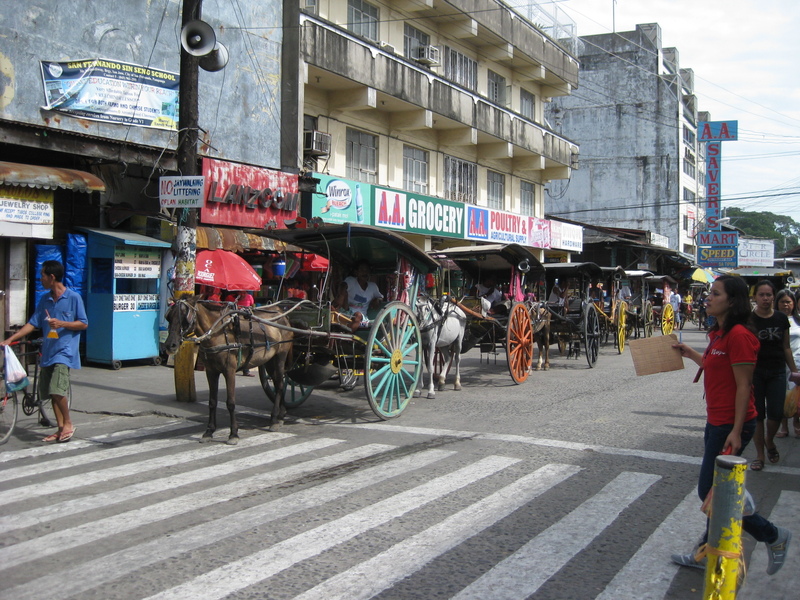 The lot where jeepney terminal mentioned on the left side of the photo is now an SM mall. 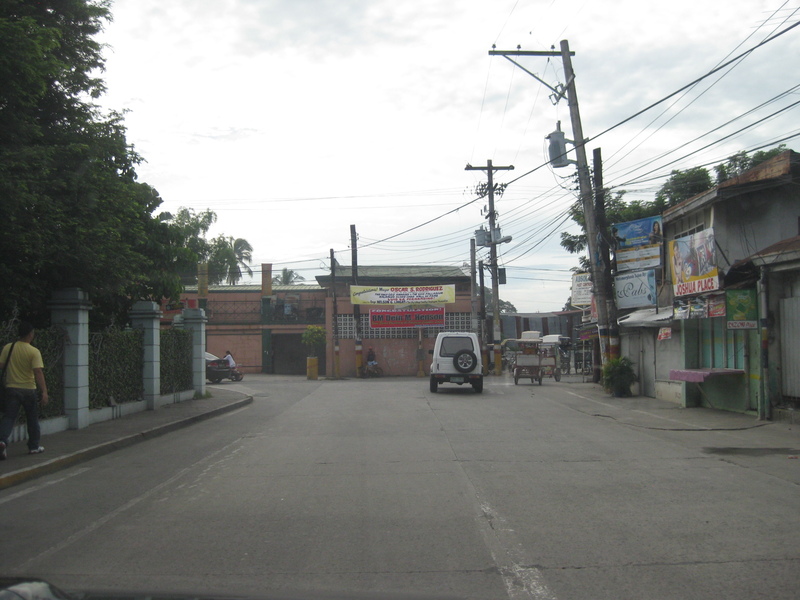 Hazards – the relocation of electric poles seem to have been an afterthought when they re-paved Tiomico. These are not easily seen at night and could lead to crashes should vehicles miscalculate their locations. The road drainage may be found beneath concrete covers on either side of the road such as those along which the people in the photo are walking over. These are supposed to be easier to maintain as crews can just lift the covers to remove blocks such as garbage. 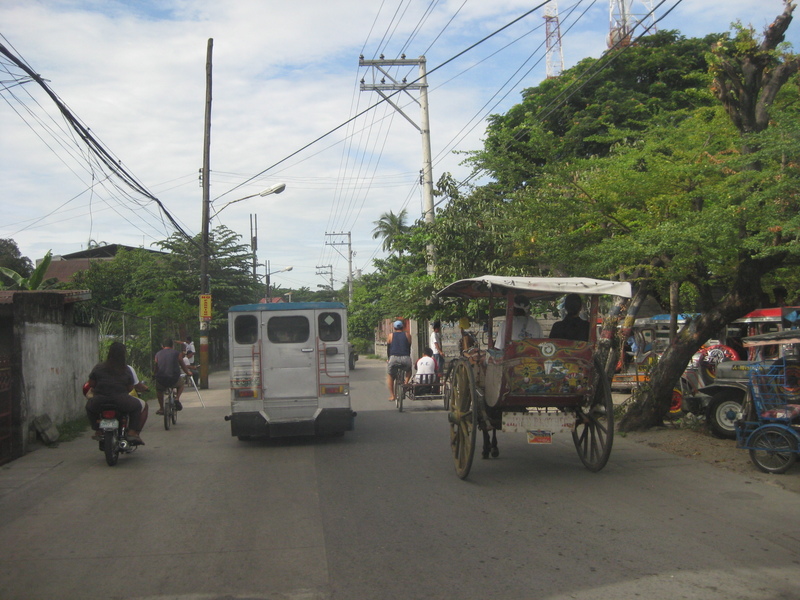 Traffic mix – I like this photo because it shows almost all modes of transport operating in the poblacion: calesas, pedicabs, bicycles, motorcycles, and jeepneys. Its a good thing trucks are banned from using these roads. Otherwise, traffic would be worse. 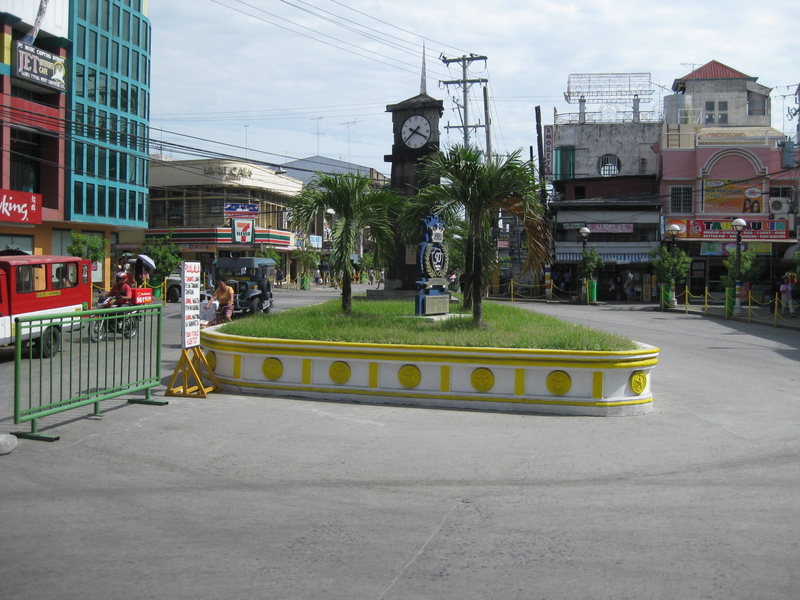 Junction – approach to the junction of Tiomico, Lazatin Street (left) and Capitol Boulevard (right). There were no signs to indicate the approach to the intersection as well as for traffic control (e.g., stop or yield signs). There are also no pavement markings. Capitol – the photo shows vehicles approaching from Capitol Boulevard, which comprise generous (wide) two lanes. Sidewalks were on either side of the boulevard except where there were driveways and parking spaces. 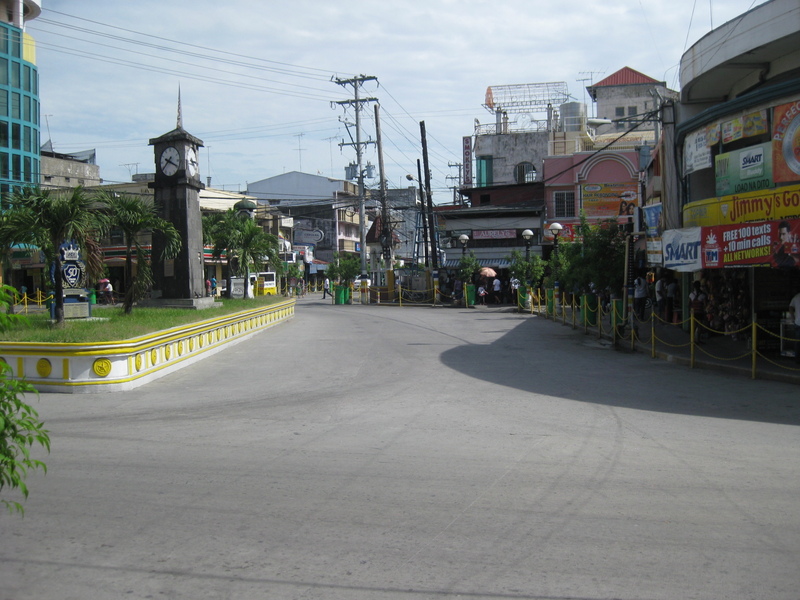 Junction – approach to the junction of Lazatin St., Consunji Street (left) and Sto. Nino Viejo Road (right). Again, there are no signs and pavement markings are already weathered. Old bridge – there is a short, old bridge just after the junction. The bridge is over a creek connecting to the main river and has 4 lamp posts that are similar to the main bridge along Gen. Hizon, and perhaps the inspiration for the lamp posts along Consunji Street. Consunji Street – is also a two-lane, one way street. Some sections have pedestrian facilities like the sidewalk on the left. The pavement markings were already weathered but still visible during the daytime. There are also less electric poles along this street and the lamp posts are appropriate in design. Heritage House – the structure on the left is an ancestral house, of which there are many in the province of Pampanga and especially around San Fernando, which is one of the oldest towns in the province. 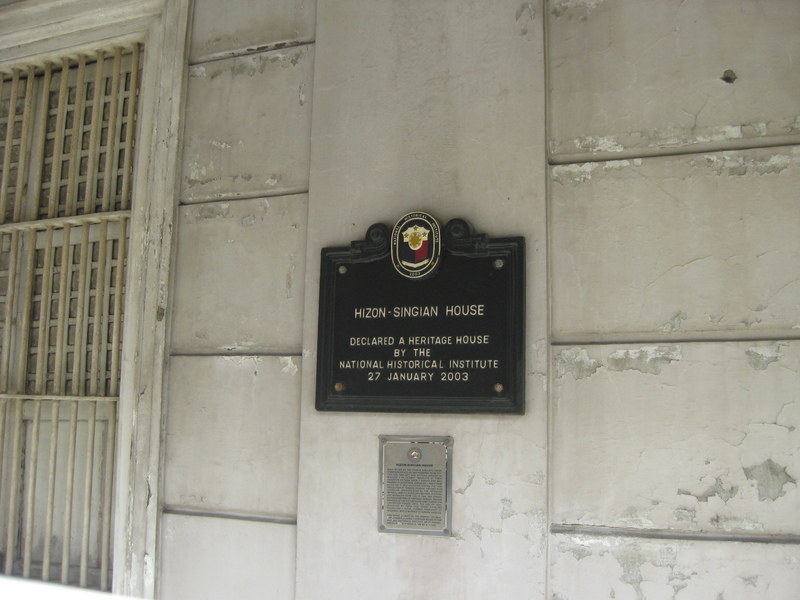 Recognition – the marker by the National Historical Institute recognizes the structure as a Heritage House. The smaller plaque provides a description of the house and those who lived or used it, highlighting its significance. There are other heritage houses as well as old houses that have not been given such a distinction (family not prominent enough?) but which deserve preservation. 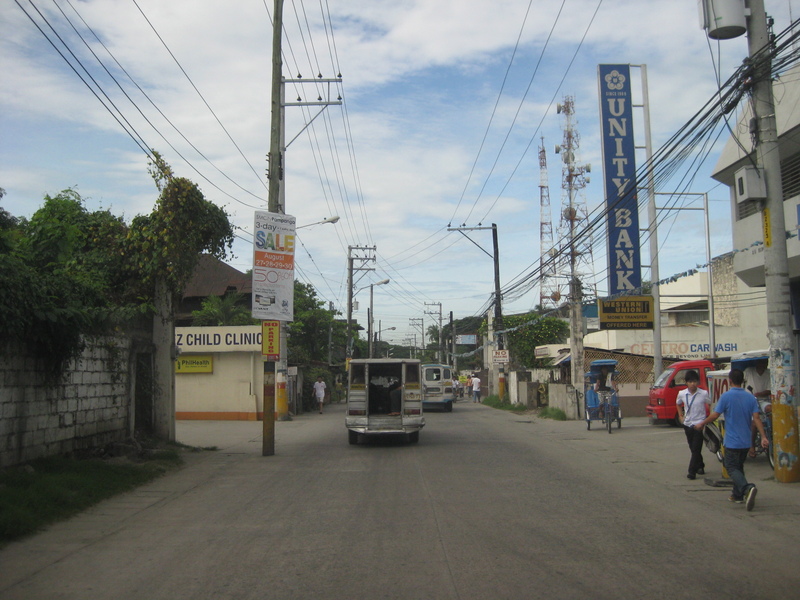 Future and present site – this lot was being used by jeepneys as their terminal at the time of our field work. 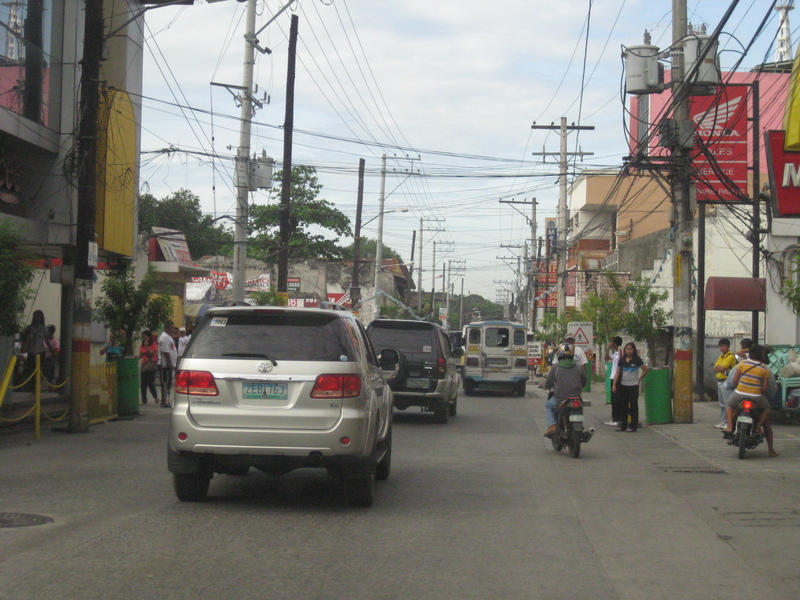 The lot is bounded by Tiomico St. in the northwest and Consunji St. in the southeast, and is where the recently opened SM City San Fernando is situated. Approach from Consunji – there are no pavement markings (yellow box) defining the intersection and no signs to help in traffic control. By d0ctrine in Highways and Streets, Land use, Motorcycles, NMT, Pedestrian on April 23, 2012 .